About 14 years ago, the city of Richmond had three Catholic parishes: St. Mary, St. Andrew and Holy Family. 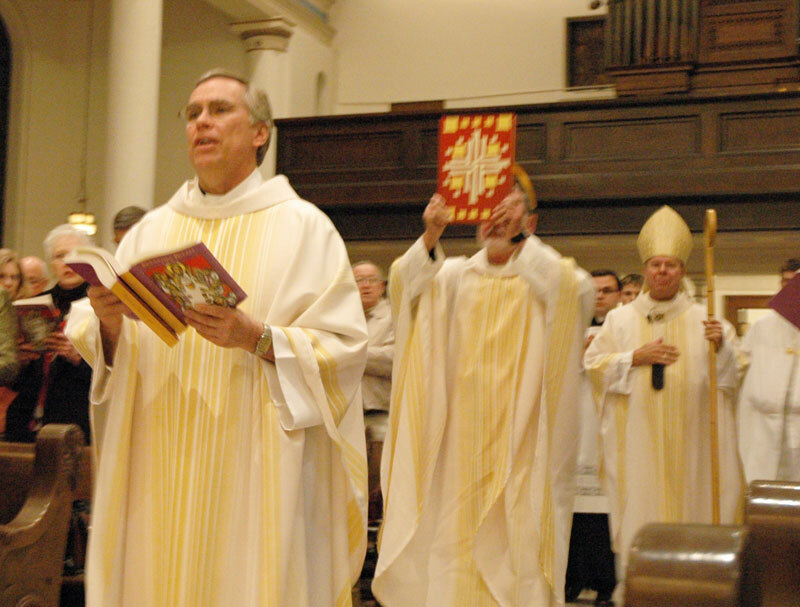 Priests serving at St. Mary and Holy Family parishes had retired or were transferred. 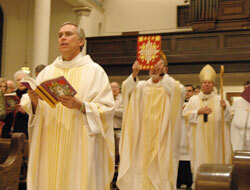 The priest ministering at St. Andrew Parish was trying to cover all three parishes. So Father Riebe came to Richmond. He saw, he cared, he loved and he healed. Ministries were formed to serve the spiritual and physical needs of our family, and not only our Catholic community, but also all residents of Richmond. We grew into a loving, caring community thanks to the guidance of Father Riebe and his love for each and every one of his sheep. Father Riebe has given of himself unselfishly to the needs of every parishioner. I’ve known him to drive to Dayton or Indianapolis at 2 a.m. or 3 a.m. to visit people in hospitals or nursing homes there. He will go wherever or whenever he’s needed. His concern and love for the young people to continue their Catholic education beyond the eighth grade resulted in the remodeling of a former elementary school into the beautiful Seton Catholic High School, and the dream of a gymnasium was completed this past year. He knows all of his sheep by name. Father Riebe once walked over to a handicapped lady sitting alone off to the side for Mass, and pushed her wheelchair to the end of a pew so she could worship with the rest of us. “Preach the Gospel and when necessary use words.” That’s Father Riebe. “Be kind! Be kind! Be kind!” is his motto. He has taught us so much about loving, caring and helping others just by showing the merciful and kind things he does in such an easy, natural manner. We have become a strong, loving and caring “Catholic Community” because of this dear priest. Father Riebe will live in our hearts forever. I am proud and feel blessed to be a member our loving, caring Richmond Catholic Community.